This is my review of the Lewis N Clark Lint Roller. Any bachelor who aims to dress nicely always should have lint-free clothes. For some reason I’ve always had problems with lint collecting on my pants. Black pants are especially problematic, as the lint shows more on them for some reason (for me at least) and makes the pants look old and dirty. 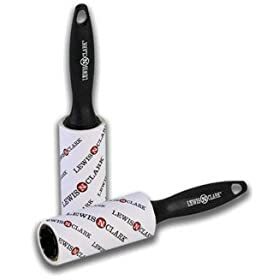 I was recently searching for a quick lint fix and I found what I was looking for with the Lewis N Clark Lint Roller. This lint remover came in a pack of two, and each roller has a sturdy black handle. I tested it out on a pair of black pants that I was wearing, since I was about to leave for a meeting. I just basically rolled the device up and down the front and sides of my pants and it quickly got rid of the lint and dust that had accumulated there. I was very pleased with this easy solution to my lint problem.